When you open your Southeast Asia guidebook and look at those pictures of longtail boats reclining on beautiful white sand amidst a backdrop of stunning cliffs, you’re looking at a picture of Thailand’s Andaman coast. The natural beauty of the islands off the west coast is world-famous. Jagged limestone cliffs rise out of sparkling blue water and the sunsets are legendary. Longtail boat, Koh Phi Phi. 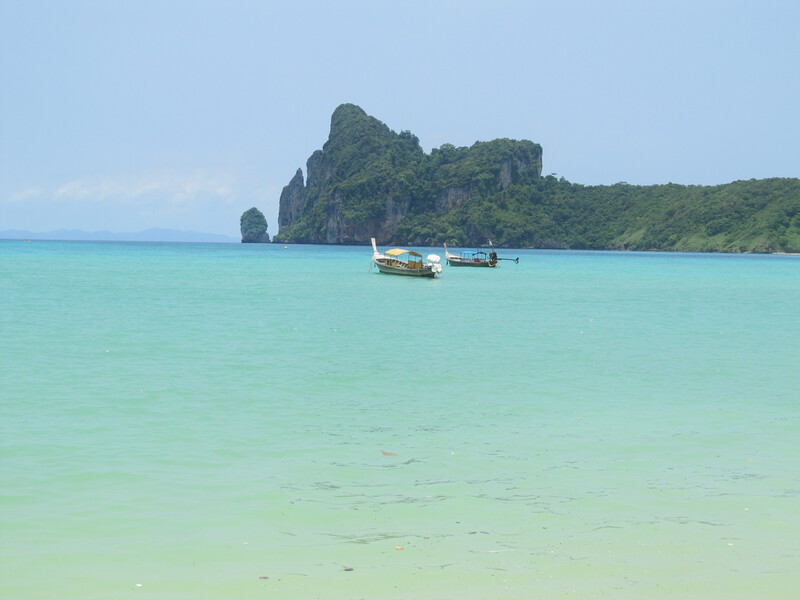 My first port of call on the west side was Krabi. 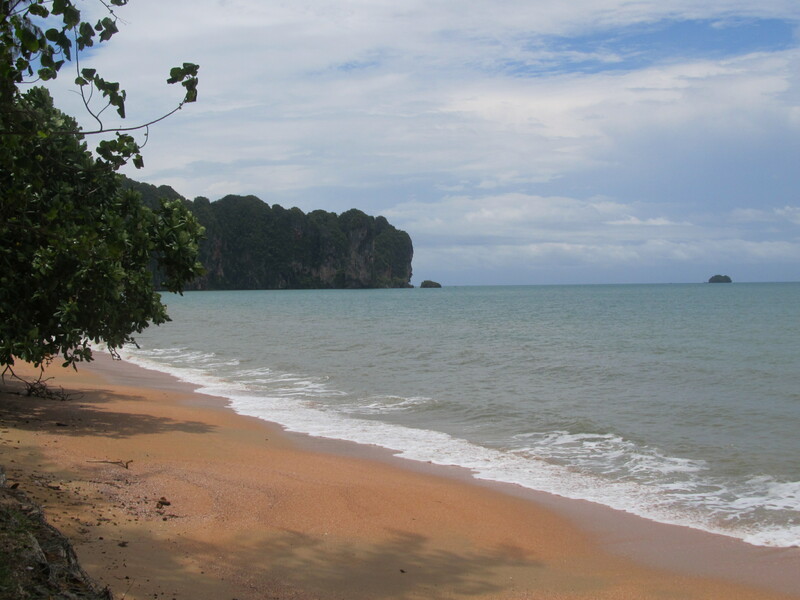 Famous for its rock-climbing opportunities, Krabi is a small coastal town surrounded by spectacular karst scenery. Unfortunately, my time here was marred by a bout of food poisoning brought on by some seriously dodgy Thai street food. My travel buddy and I decided to sample the cuisine at the local market and some unidentified seafood massively disagreed with me. The following day I attempted to visit one of the local beaches whilst suffering from horrendous stomach cramps. This part of Thailand definitely has the natural beauty thing going on, and I tried to relax and enjoy the scenery whilst feeling extremely rough. Krabi was pretty quiet and laid-back whilst I was staying – I wouldn’t recommend a long visit unless you are there for the climbing. Oh, if you do visit be careful with the food at the street market! 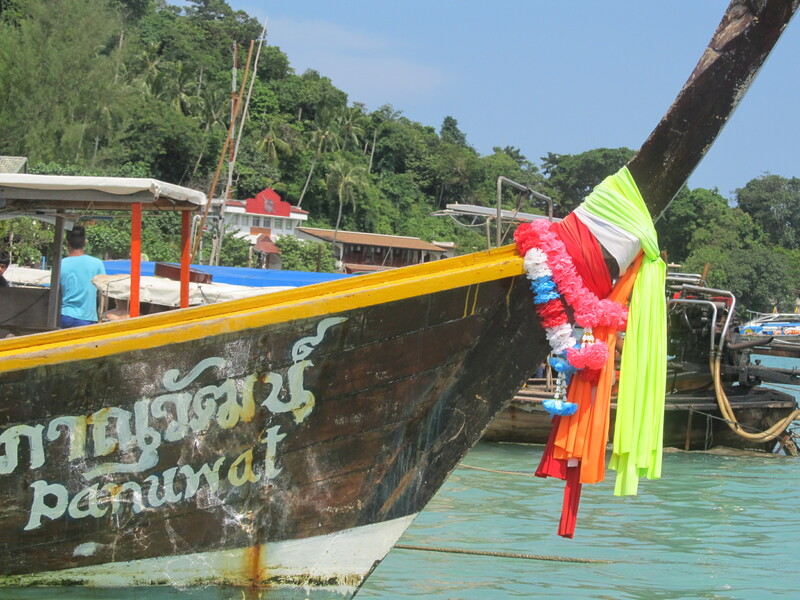 From Krabi I caught the boat to one of Thailand’s most popular islands, Koh Phi Phi. My expectations were high. All I’d heard from other travellers were good things about the place. I was looking forward to beautiful beaches, crazy nightlife and, of course, the one and only Beach. On arrival we had to pay a small fee to enter the island. The money was supposedly being used to keep the island clean and sustainable. I didn’t see the effects of this tax at all whilst on Phi Phi. It’s dirty, there are drainage problems and floods everywhere, and the streets are strewn with rubbish. Despite the fact that the whole island was basically levelled by the 2004 Tsunami, the place is overbuilt, overcrowded and, in my opinion, spoiled. Surely having to start from the ground up just a few years ago was an opportunity to do things properly and protect the natural beauty of Koh Phi Phi? I think it’s a real shame that the tourism industry has taken advantage of the popularity of the island and, frankly, made it into a bit of a shithole. Clear seas off the coast of Phi Phi (with hidden rubbish). Signs of the tsunami’s impact are evident. There are photographs of the relief effort in restaurants; signs everywhere pointing towards the tsunami shelter, and building work is ongoing. It’s sad and a little scary to think about what happened to the island that day – but if you let fear hold you back from enjoying a place you’d never visit half the world. The stunning natural beauty of Maya Bay. Although I was overwhelmingly disappointed with Koh Phi Phi we did have an OK time here. The beach is stunning, even though you have to avoid all the garbage floating around in the sea. 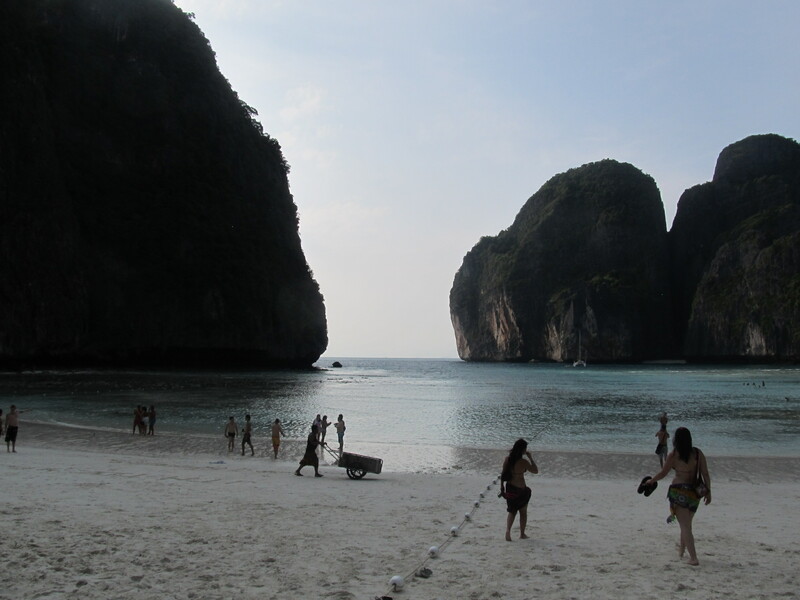 Nearby Maya Bay aka ‘The Beach’ is unbelievably beautiful and unmissable. You can camp there overnight which I would recommend. The nightlife is definitely epic and not to be missed. My friend and I did an open water dive off Phi Phi which was pretty good, although the visibility was appalling. We went down to a site called ‘the wall’, essentially a wall of coral, and there was a rip current so it made for a different dive to anything I’d experienced before. 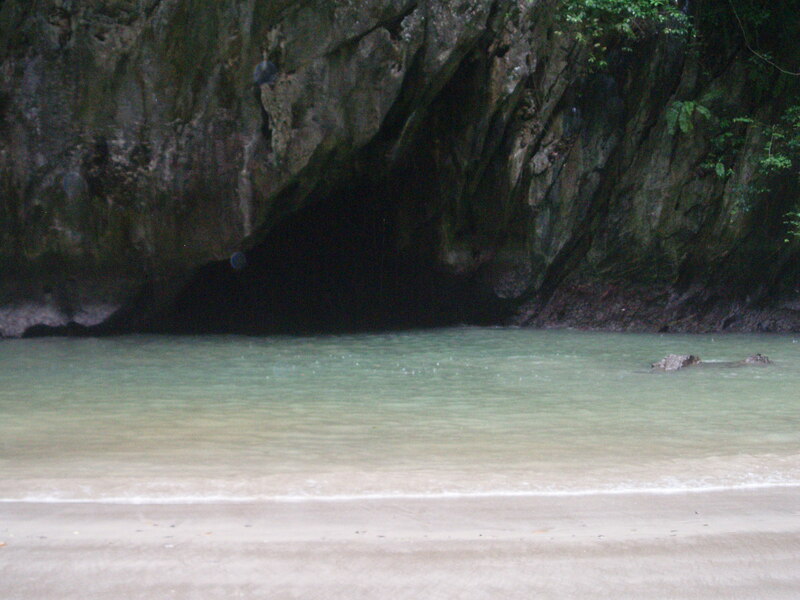 The cave we swam through to look for hidden treasure. I wasn’t particularly sad to leave Koh Phi Phi and head over to Koh Lanta. 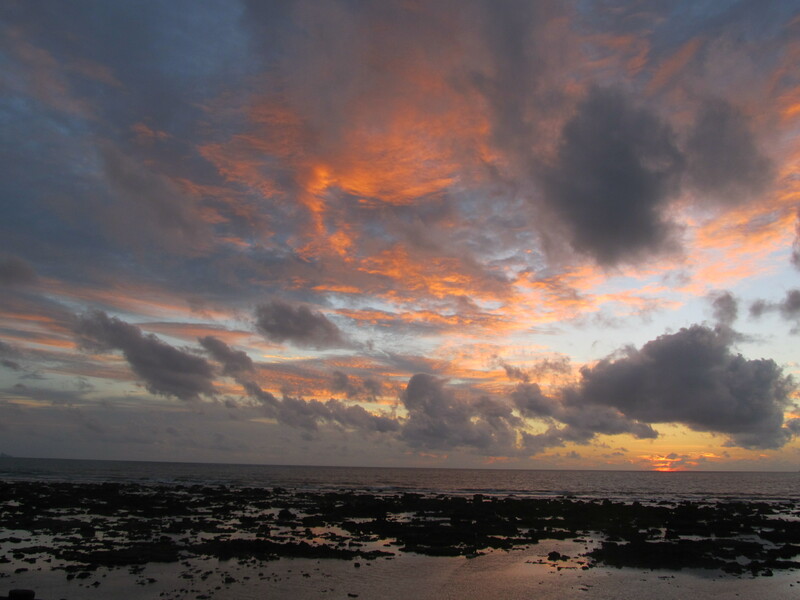 We’d picked Lanta as it was on the way to Malaysia and the last big island in the west. It was a quiet time of year when we visited, but we enjoyed it all the same. Our resort, Blue Andaman, had a wicked bar, lovely pool and fabulous sunset views. We pretty much chilled out on Koh Lanta, got into our books and relaxed. One day we did a tour of three nearby islands which was really good fun. We swam through a pitch-black cave to a hidden sinkhole where pirates used to hide treasure and the ecosystem is unique. Scary, yet awesome. One of the islands we visited for lunch was so picturesque and had a real desert island feel. Our late afternoon ritual of happy hour cocktails and sunset was just what we needed to enjoy Lanta. Cocktails at sunset, Koh Lanta. After a couple of weeks on Thailand’s west coast it was time to head south to Malaysia and the next chapter of my trip. My two and a half months in Thailand had been incredible and the country has a lot to offer to long and short-term travellers alike. Yes, it’s very touristy. Yes, some of it is spoiled by development. Yet there is still enough beauty to be found in Thailand’s nature, people, food and philosophy that it’s a joy to visit this top traveller destination. And when you do visit, put Koh Tao at the top of your wish list – you won’t regret it. Hi, I want to subscribe for this web site to obtain latest updates, thus where can i do it please help out.